In a week where Baz Luhrmann’s The Great Gatsby is captivating audiences with grand, lavish cinematography and color, take a moment to check out the 18th century’s competition — an immersive-media extravaganza conceived and marketed by artist-entrepreneur JJ Audubon. It’s so big that the New-York Historical Society had to break it into three parts. 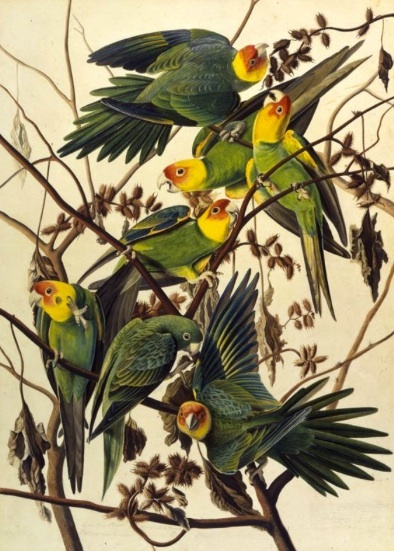 Rush to see Audubon’s Aviary: Part I of the Complete Flock. NYHS owns just about every watercolor that JJA ever did for the gigantic engraved folio that he sold to celebrity clients back in the 1820s and 1830s. 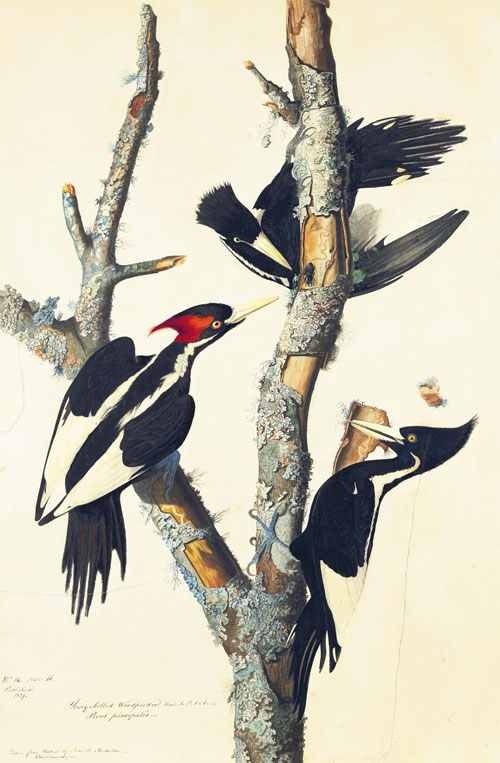 He created watercolors of every bird in America (474), made the images life size for maximum visual impact, had them engraved by UK superstar Robert Havell, Jr., structured a unique package to appeal to high-end collectors, embarked on a road show, and sold subscriptions to his IMAX-sized The Birds of America. NYHS kicks off its trilogy by presenting Audubon’s original watercolors in the order in which they were engraved and filling an adjacent gallery with the artist’s earliest work. The exhibition reveals how this self-taught artist developed his remarkable skill with pastels, a pin board, and a cut-and-paste approach. Take a look at the on-line gallery. A nice touch is the collaboration with the Cornell Lab of Ornithology, who provides us with recordings of the birds – both on a free audio device in the gallery and here on line. If you can’t get to the show, peruse the “early birds” stories and highlights in this fascinating PDF by Roberta Olson from the journal Master Drawings, where you’ll learn some behind-the-scenes dish on JJA and see his headshot. Scrolling through, you’ll also see some of his earliest paintings, which were only discovered in the La Rochelle Museum of Natural History in France in 1995. In the PDF, you’ll also read about how he was inspired by Mr. Peale’s museum in Philadelphia early in his career, ended up painting some crazy Golden Pheasants (now residing at Harvard) that were once presented to George Washington by Lafayette as a gift from the King of France (Figures 18 and 19), observe nearly identical reworked paintings (starting at Figure 34), and see the grid system he used for reference on his pin board (secrets revealed). This entry was posted in Art, History, Museums, Nature by mssusanb. Bookmark the permalink. I’m going NOW! Thanks Susan. Great, Arlene! It won’t be a quick visit because this flock is vast! You’ll no doubt get even further inspiration for your AMNH tours and find some familiar faces and feathers from the Hall of NA Mammals! Enjoy!